Roanne is often known for its gastronomy and its textiles. The city has retained some Gallo-Roman elements such as pottery kilns and the dungeon of the 12th century castle. Its geographical location and the possibility of navigation on the Loire give it an important economic position. With only one supply route to the Rhone valley for the pewter road, it became the economic route for the transportation of raw materials from its industries and Roanne wine to major cities. 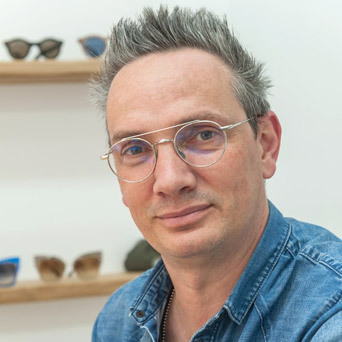 Rodolphe, a native of Jura, the cradle of French spectacle manufacturing, married an optician from Roanne and opened his shop at 86 rue Maréchal Foch in 2004. It is appropriate to state that he simply grew up with eyeglasses, as his skills in this area are amazing. He has, among others, designed the model “Rodolphe" for the limited MYKITA edition for the opticians Rien Ne Va Plus. A complex equipment, a particular visual defect, an original frame to select ? This doesn’t pose a problem for this enthusiast, he loves challenges ! The selection of exclusive frames, the Essilor and Nikon ophthalmic lenses, everything is done with care, but also with kindness and humor, in short, everything to make you love the eyeglasses. This Dita frame incorporates a new system of swinglike bridge for an exceptional comfort. It is fitted with Essilor Varilux Digitime Orma EPS Crizal Prevencia lenses that are specifically made for those who spend plenty of time in front of their screens. Should you need information, an appointment or renew your contact lenses order, feel free to contact us.